/ Event | Hernan Cattaneo Back at Stereo Montreal – How Lucky are We? Hernan Cattaneo is a Montreal favourite and the mastermind never ceases to impress us. Harmonizing with our souls, he takes us on long beautiful journeys through frequencies pushed out of a beautiful sound system and dance floor we find at Stereo nightclub. It is unbelievable that we are so lucky to see Hernan more than once a year and even more unbelievable that he exceeds expectations every time. El maestro’s presence behind the decks for me is the ultimate Stereo experience. He’s shaped many of our best moments at (((HOME))). Energy fills the room and there is nothing but love and smiles flowing all through the building when Hernan plays. His 30 great years of experience really shine through and his ability to adapt to crowd reactions admirable. While gracing us with the 22 hours marathon along with Guy J back in December, I reconnected with a woman from the Netherlands (also a huge Hernan fan) named Mimi, whom I met at his Fire Dome set at Burning Man. Mimi and I made had made a pact that we would see each other 6 months later at Stereo, and our love for Hernan’s music brought us back together as we danced for hours again! These types of international experience about love and music are dear to me and I’ve included below our mini Burning Man to Stereo reunion photo! Music is magic, and being able to express yourself through love and vibrations is how we connect. People coming together to share that experience is unforgettable. Because Hernan brings this kind of energy to all of his sets, he allows that beautiful human connection to thrive. To spice up the night, Stereo resident & artist on Hernan’s very own imprint Sudbeat: Simply City will be opening. Having a strong reputation for steady groovy progressive journeys, we’re sure not to be disappointed. We are in for a treat, genuine energy from two talented artists! They will take us on a timeless journey surrounded by people we love! 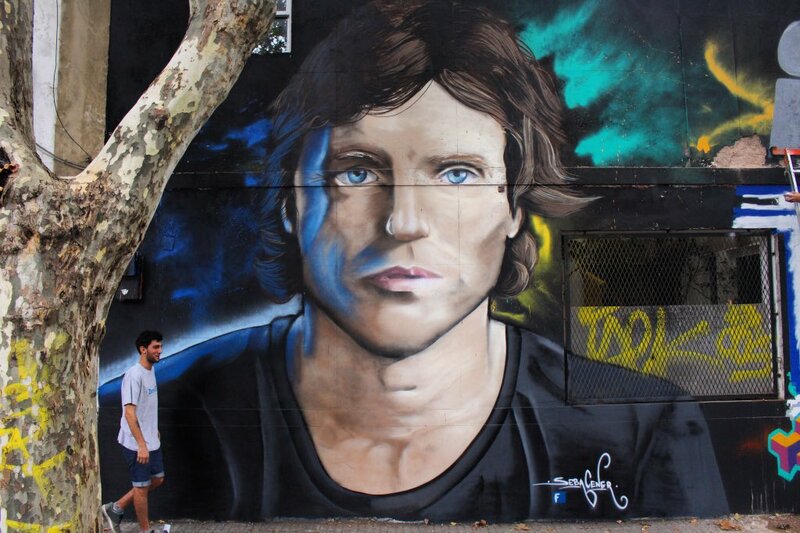 Above is a beautiful mural by Seba Cener in Buenos Aires, Argentina. As a result, el maestro’s music really does touch our hearts; artists who inspire artists are what keeps passion and love alive! I’m sure most of you are as excited as I am for this weekend and I cannot wait to dance alongside you beautiful souls.